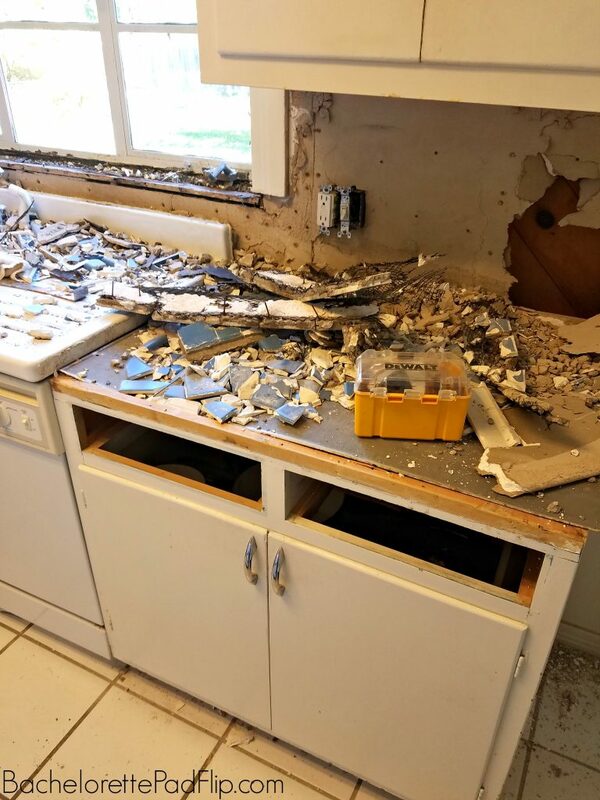 As with many projects when flipping, the kitchen remodel at Flip 5 was going to be a brief overhaul. And then Murphy’s Law kicked in. I had a vision in my head, but given all the setbacks, I questioned it along the way. Even though I planned a complete overhaul, I knew I wanted to keep the original character in the space- that vintage stove, the original venthood, and even the cabinet pulls. 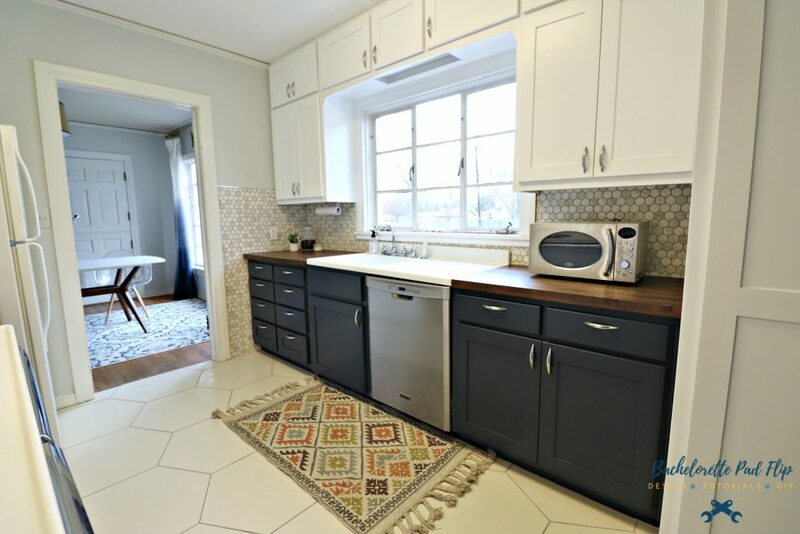 So my task was creating a newer kitchen with old school throwback charm. The kitchen was so charming. I loved that since its construction in 1951, very little had been disturbed. 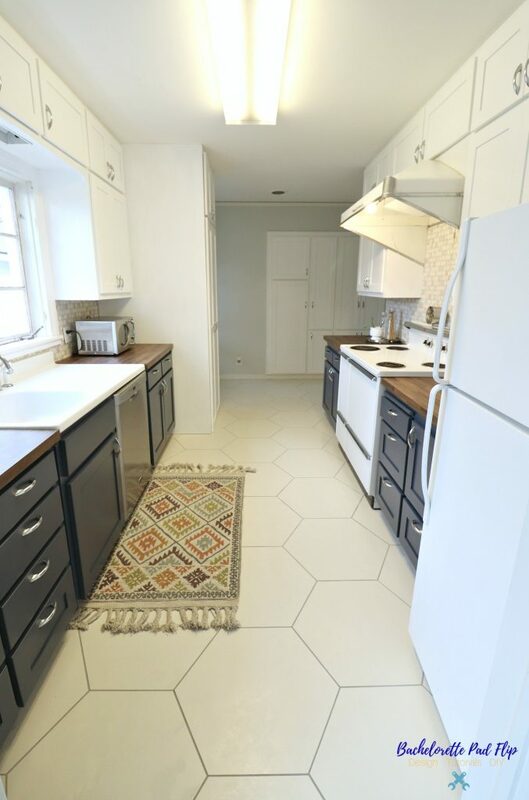 This galley style kitchen was just that…a galley. Without extreme effort and expense, this kitchen was going to remain a galley style. But I still wanted to give it a fresh look that felt bright and modern. 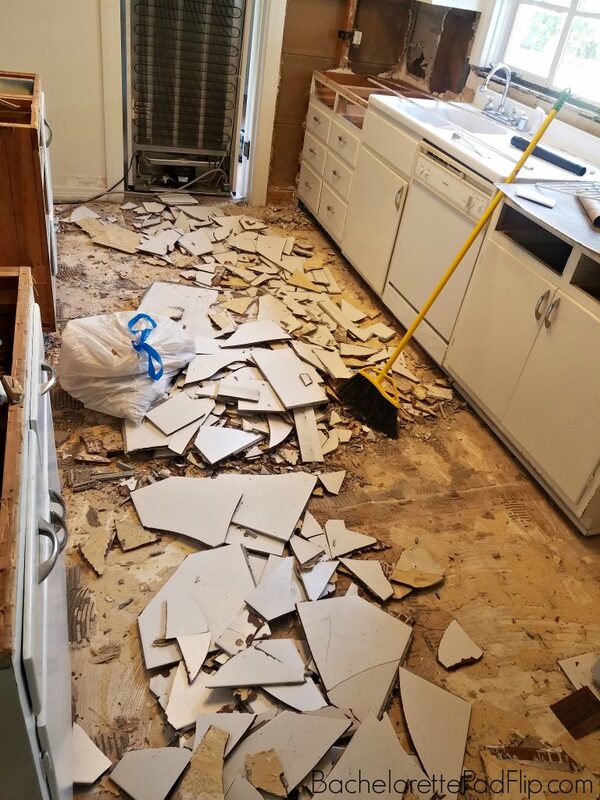 The original countertops were chipped, cracked, and broken…and plus, tile countertops are hard to keep clean and sanitary over time. I don’t think the floor tile is original- maybe mid 1990s? While it was in good shape, I just felt like it didn’t jive with the era of the home. 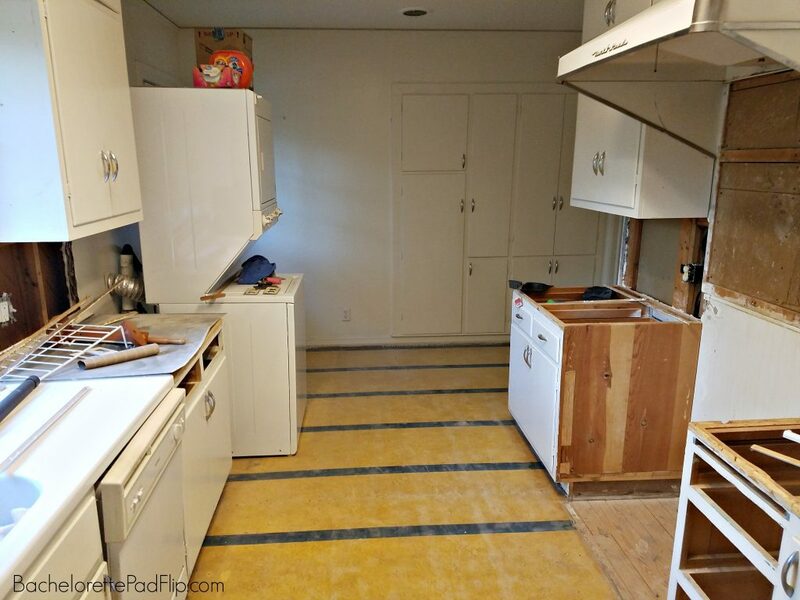 My original plan was to just replace the floors and counters, but the project took on more changes as it went on. Eventually, I not only gutted the floors and countertop, but I replaced the cabinet doors, & dishwasher. I originally had plans to do the demo myself, but I quickly realized the demo was pretty extensive, and I had no time for it! And this is where Murphy’s Law started kicking in. I hired a crew I had used at other flips, and they just weren’t experienced in the finesse of property gutting. They beat the place to bits. And eventually, I couldn’t get them to come to work. They had a lot of excuses, but not a lot of work ethic. So with demo done and one crew fired, I had a non-working kitchen and dust and debris everywhere. The original crew promised a 3 week turnaround from demo to completion. At almost a month in, all I had was a demoed non-working kitchen. I scrambled trying to find another crew without much luck, so I eventually hired the tile store where I purchased the tile to install it…at a much higher price than I’m accustomed to normally. Despite the extra cost, the new crew was extremely fast and experienced…albeit expensive. If you recall, when I started this house flipping journey seven years ago, this kitchen would have been an improvement over how I lived for a year. I lived in a kitchen with no appliances, no furniture, no flooring, no internet and no cable. So despite the annoyance, I’ve been through far worse! I opted to keep the original cabinet bases but update them with new cabinet doors! 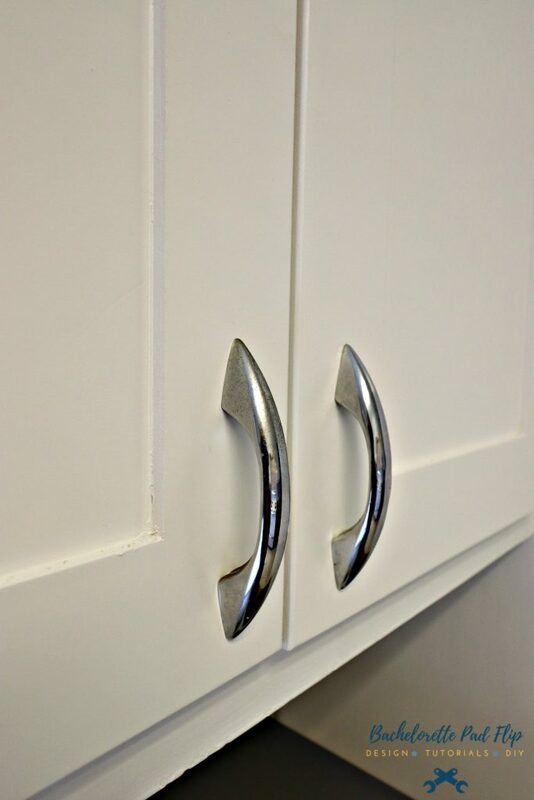 I kept the original chrome cabinet pulls and replaced the visible hinges with recessed, soft-close hinges. Actually, the soft-close hinges were a gift from the cabinet company I used, Shilo Cabinets & Interior. And I’m obsessed. I’m also loving Benjamin Moore’s Chantilly Lace white. It’s the perfect, non-creamy white, and I’ll definitely be using it again! 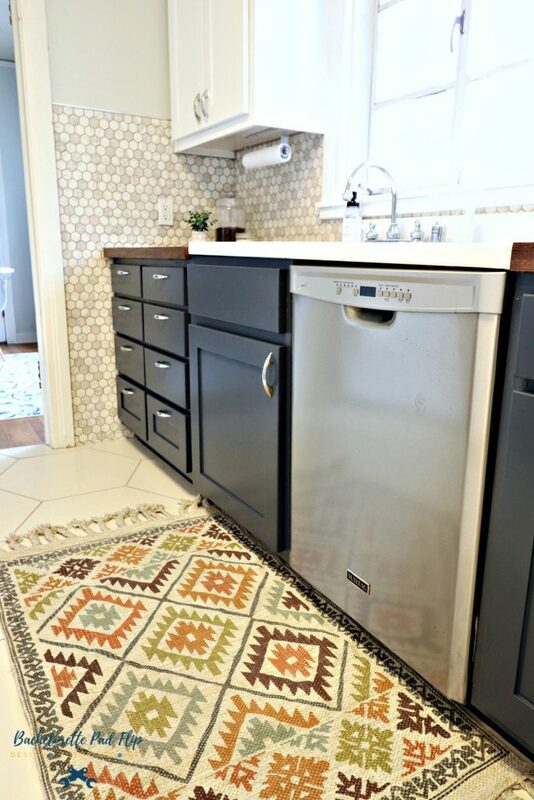 Keeping the original farmhouse sink was one of the best design decisions I made for this space. It really popped against the faux butcher block counters. And it adds instant character to the space! The original window ledge was tiled like the counters, but I hired Heritage Woodwork to create a custom ledge to look original. 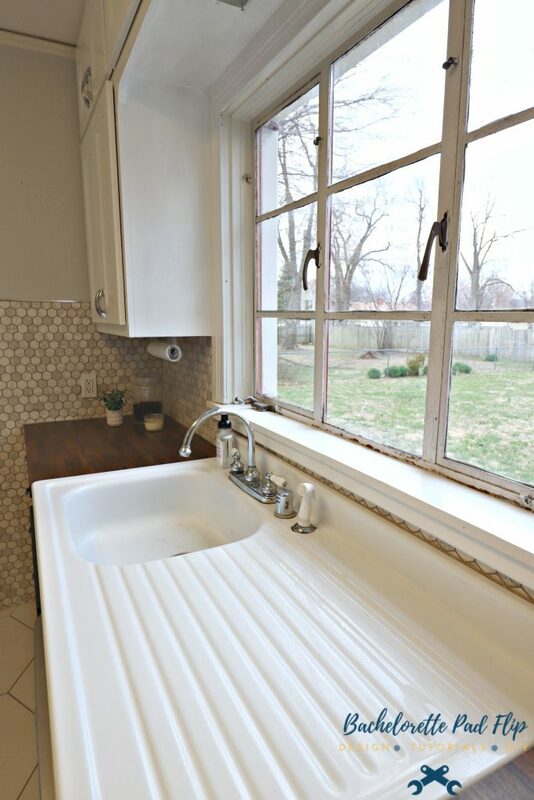 Everything about this area– the original large window, the sink, the ledge…I love it all! Another choice I’m proud of is keeping the original midcentury stove and vent-a-hood. Aren’t they both amazing? They are always conversation starters, and they work! 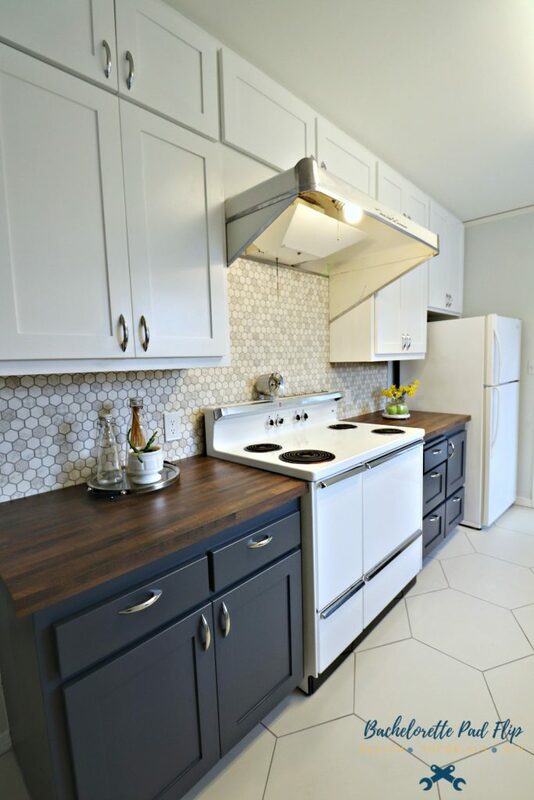 Between the sink, stove, and hood, I don’t think the space lost its original charm. 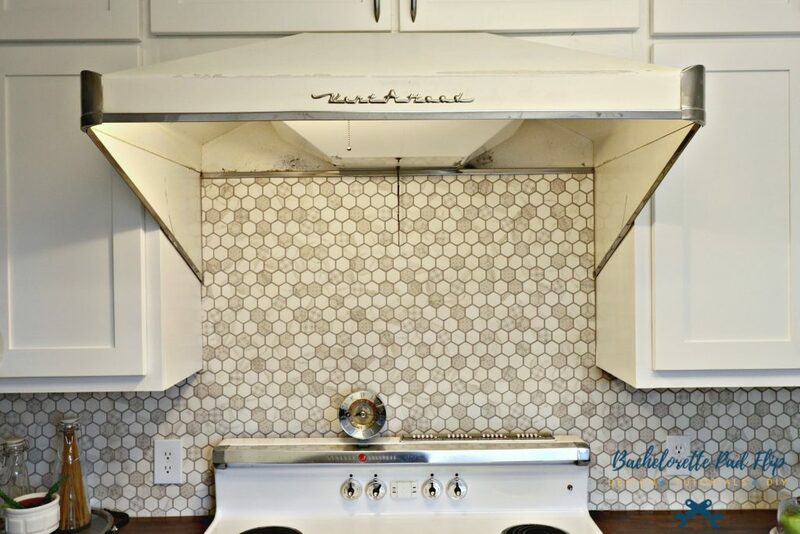 The original venthood had a metal backsplash that ran behind the stove, and I’m so glad I was able to get that removed and do a feature with this beautiful hexagon tile. One of the silver linings of the first crew getting fired was that when I told them my plans for the backsplash, I told them I wanted to use schluter on the edges. They refused. The new crew really saw my vision, and they helped me track down chrome schluter since it typically comes in a brushed nickel. And I love it! It almost looks original and helps add a little character to the space. I have really, really loved these countertops. 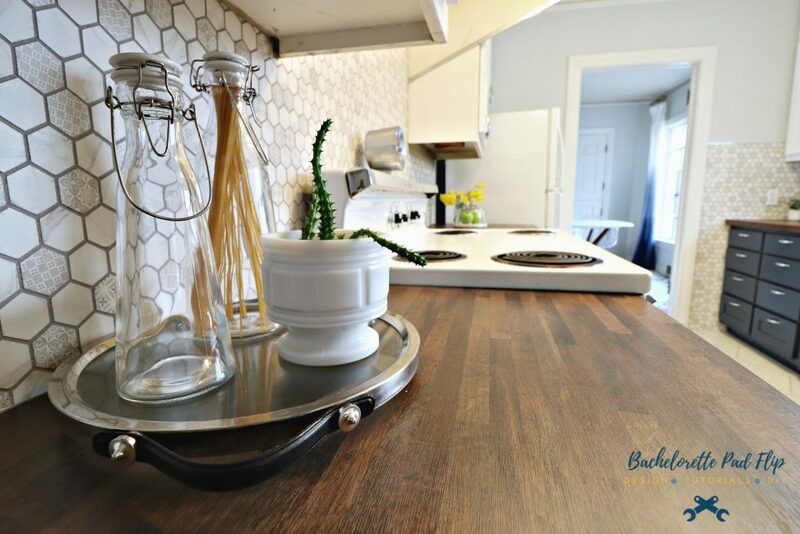 They are zero maintenance but bring the charm of butcher block. I’m glad I chose the darker stain finish. Despite being laminate, the wood grains are eerily real! 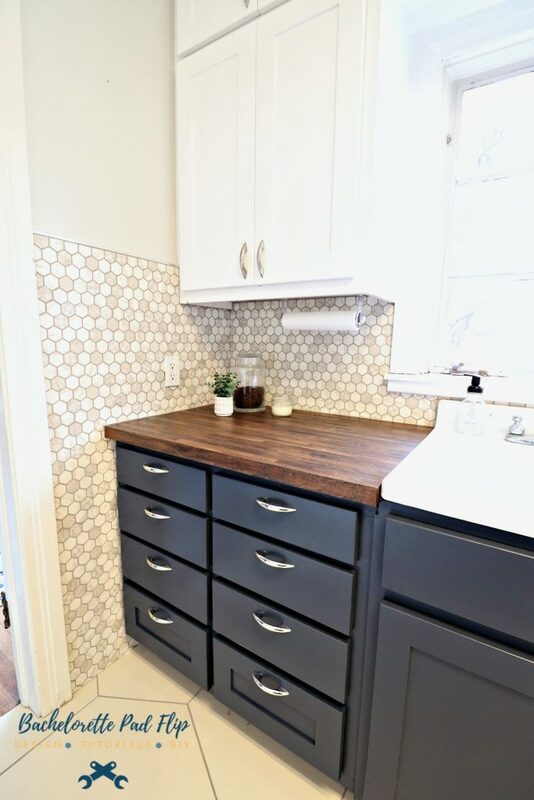 One choice that really had people questioning my sanity was my paint choice for the lower cabinets. I opted to jump on the two-tone cabinet trend, and I haven’t regretted it at all. I went bold with Benjamin Moore’s Hale Navy. 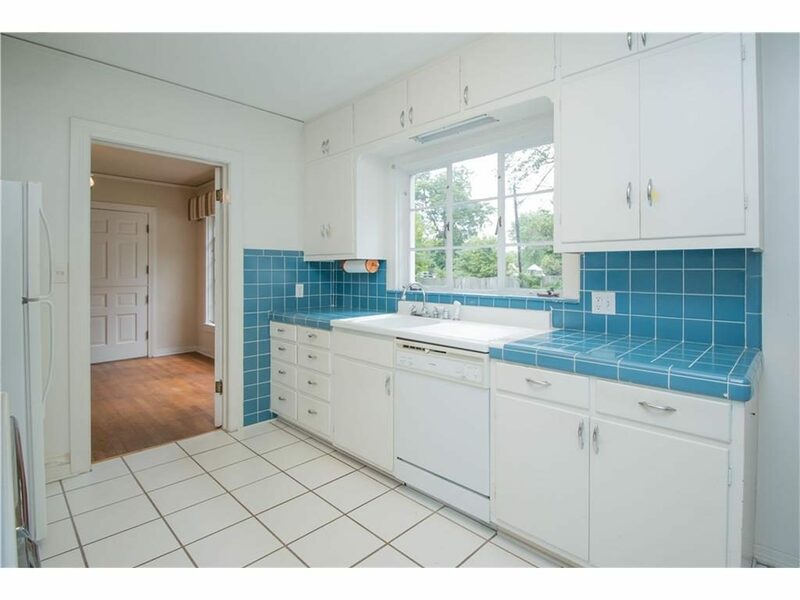 I loved that the original kitchen was blue, and I wanted to keep that vibe. The new cabinet doors and drawer fronts look phenomenal with the dark paint. But this where Murphy’s Law kicked in again. I’ve had experience in the past where painted cabinets start to chip and flake. I hate that! So before I had the cabinets painted, I checked with my fellow Arkansas pal Kayla Payne who does phenomenal painting. She was adamant that PPG’s Breakthrough paint was the best way to go, so I went to the Benjamin Moore paint shop…only for them to convince me that their Advance paint was a better choice. I think their recommendation rested solely on the fact that their store didn’t carry the Breakthrough, and it would have required having it shipped from a store an hour away. So I took my Advance paint, had my painter paint all of the cabinets. And guess what happened in two weeks? The paint was flaking…badly. So Murphy’s Law hit with the tile, and then it hit with the paint. So after two weeks, I had chippy paint on my cabinets. So, I went back to the Benjamin Moore store and held my ground until they gave me free Breakthrough paint…that I had originally wanted anyway. So with my new paint in hand, my painter had to come back- again– to repaint the cabinets. I had also originally planned to keep the existing dishwasher a while longer, but after evaluating the electrical hookup on the dishwasher, the appliance guy suggested I go ahead and replace it. So in the middle of the chaos, I had to start dishwasher research. And let me tell, the leader of the loser pack based on reviews was Kitchenaide- even though I liked their designs. So I opted for a simple and efficient stainless steel Maytag. The reviews were great, and I caught it on sale (of course). 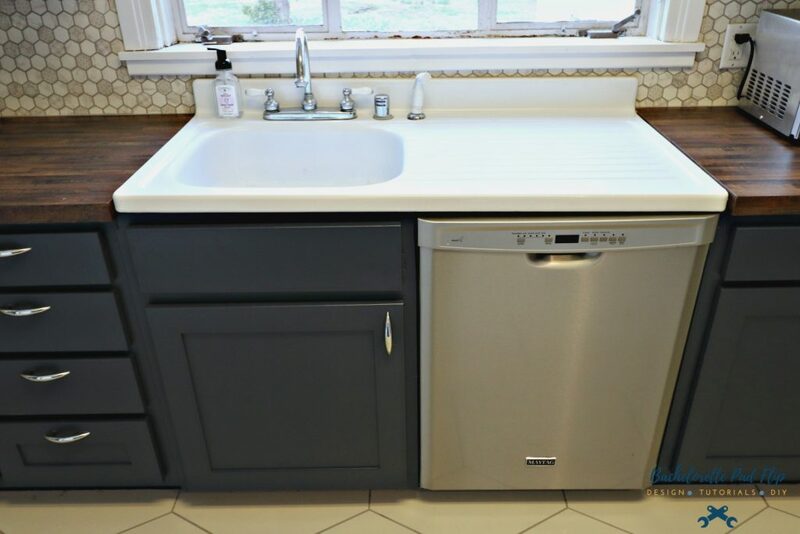 I didn’t want a white dishwasher because the floor tile was more of a bone color, and I didn’t want the dishwasher to clash. Weird, right? The original kitchen had a very obvious problem- it was also the laundry room. The stacked unit stuck out like a sore thumb. I evaluated all my options to move the washer & dryer, and, in the end, they had to stay in the kitchen. So my next solution was how to disguise it. 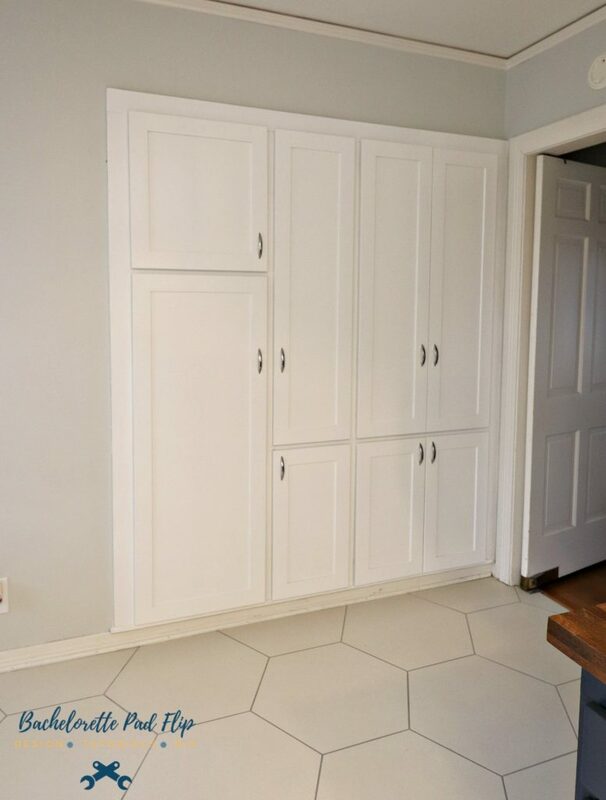 My cabinet people were able to build a custom “closet” that appeared to look like a pantry, but, in reality, it houses the stacked unit plus storage. I love the grid pattern they added on the side, and I requested that disguised side door for easy access to the plumbing. 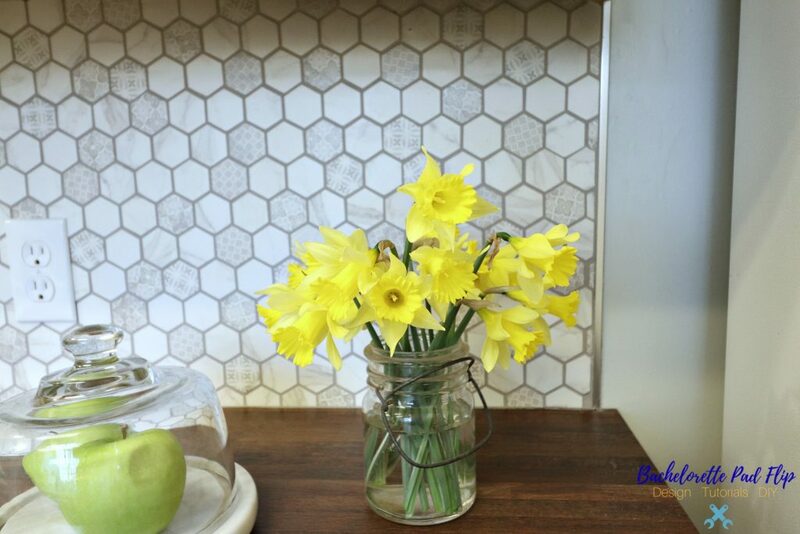 One design I loved from the original kitchen was the floor to cabinet tile backsplash. Even though I gutted the original tile, I wanted the new tile to mimic that design. I love the dramatic effect it adds, don’t you? Even though this kitchen is a galley style, it gets tons of natural light through that beautiful window & the dutch door. 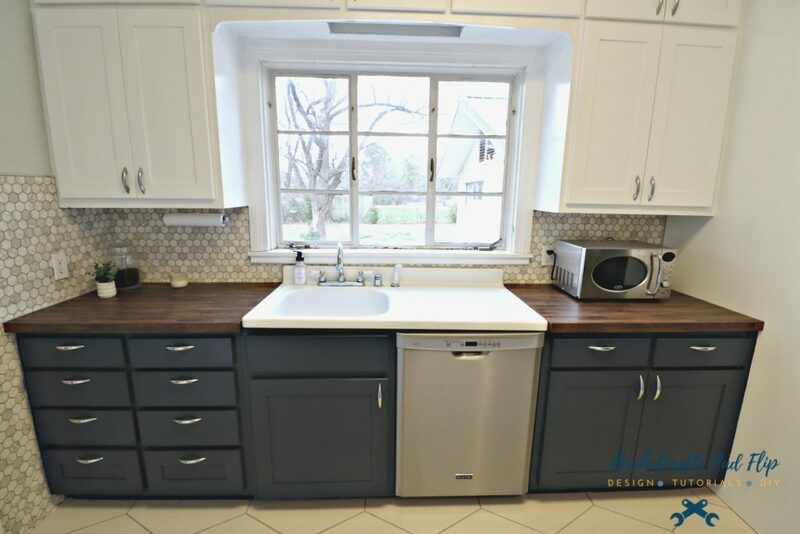 I was slightly concerned for a minute that the dark Hale Navy would darken the space, but the white cabinets really bring contrast to brighten the space. 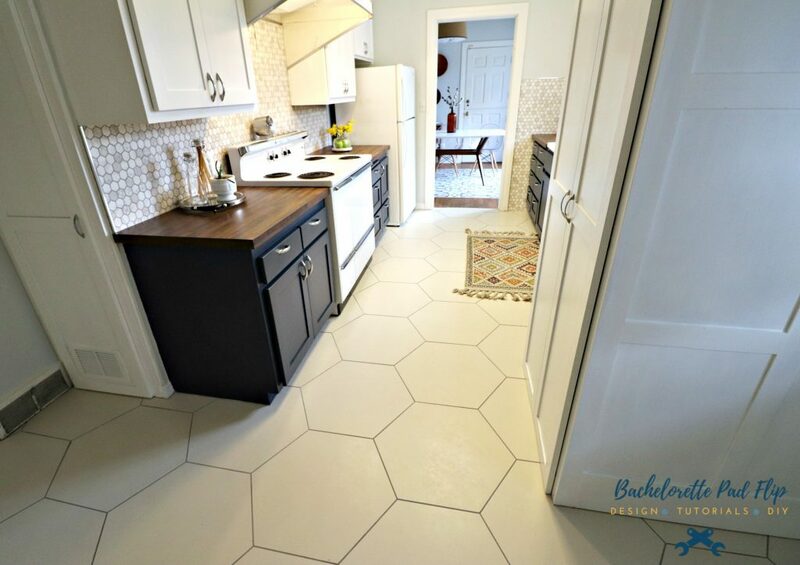 I spent up on the floor tile, and I love the style…but they are very high maintenance to keep clean. But don’t they make an impact? One of the perks of this kitchen is that it is not short on storage! 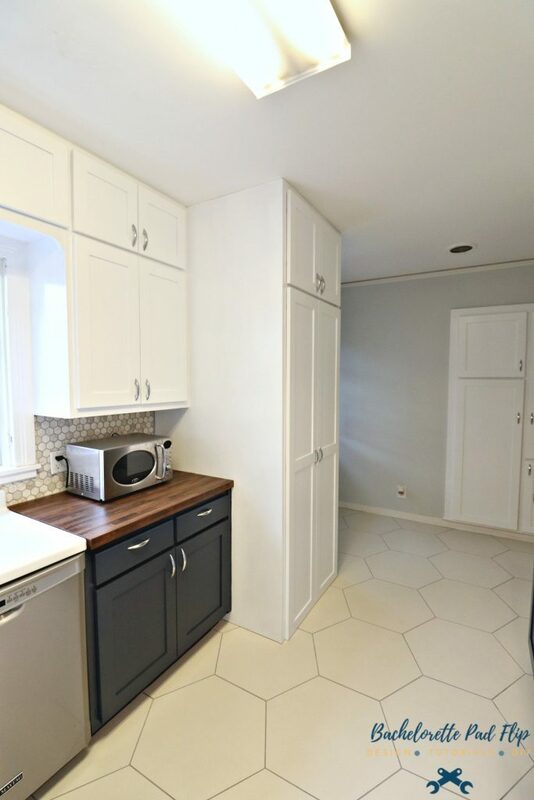 There is not only ample cabinet space, but a wall pantry and murphy ironing board. 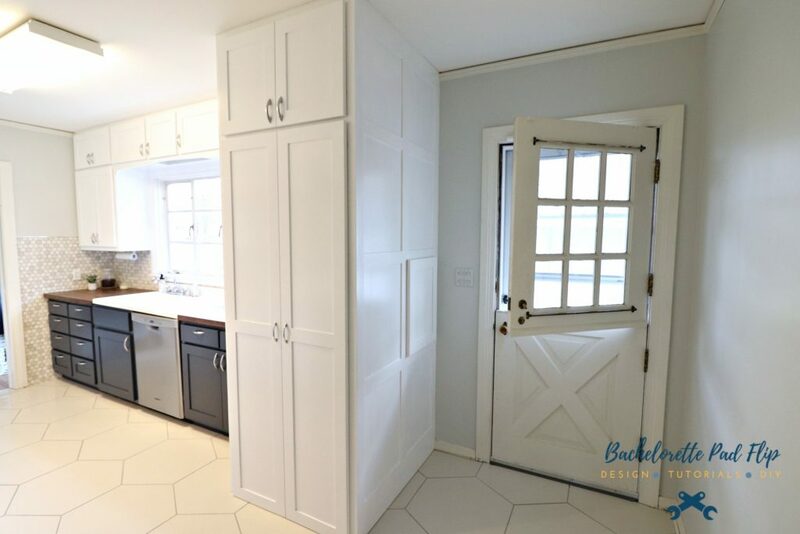 Since I replaced the cabinet doors with shaker style new ones, I had new doors and recessed hinges made to match the cabinet doors. This kitchen has come a long way! What started as a few week projects turned into a 6 month project. I expected to spend maybe $5,000…with the hiccups and delays, I spent right at $10,000. I’m glad that I was able to make a big impact for that $10,000 though! And one of the small, almost not-noticeable changes was the new door to the hot water tank closet. The original door had “bullet holes” for breathability, so I had a new door made to match the cabinet doors and added a grill instead of bullet holes! I am so glad this kitchen remodel is over! It took so long and so much money, but I love how it turned out. 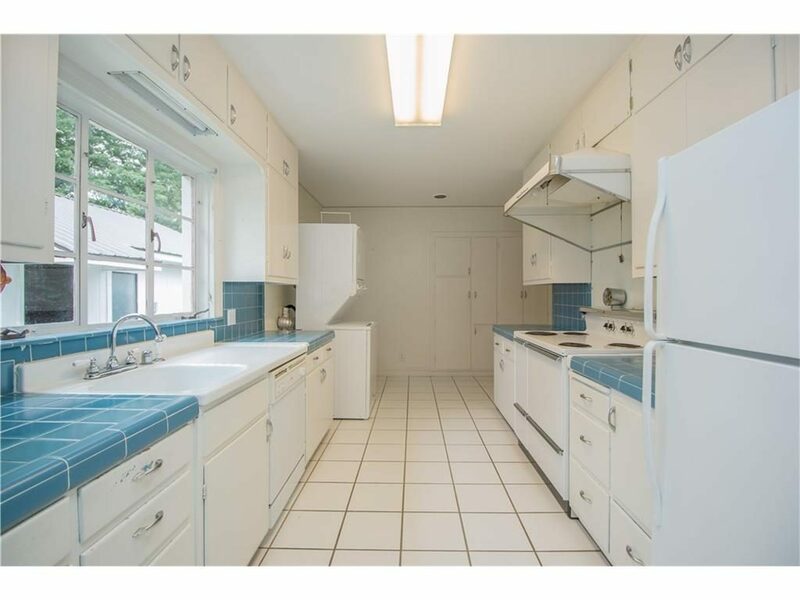 Typically, incorporating such bold design choices is risky for a flip, but given the midcentury downtown historic vibe of this house, I have a little freedom. And the freedom to stretch my design muscles was so fun! Well, you knocked another flip out of the park ! Although I was leery of the dark navy, your hunch trumped my hesitation big time. 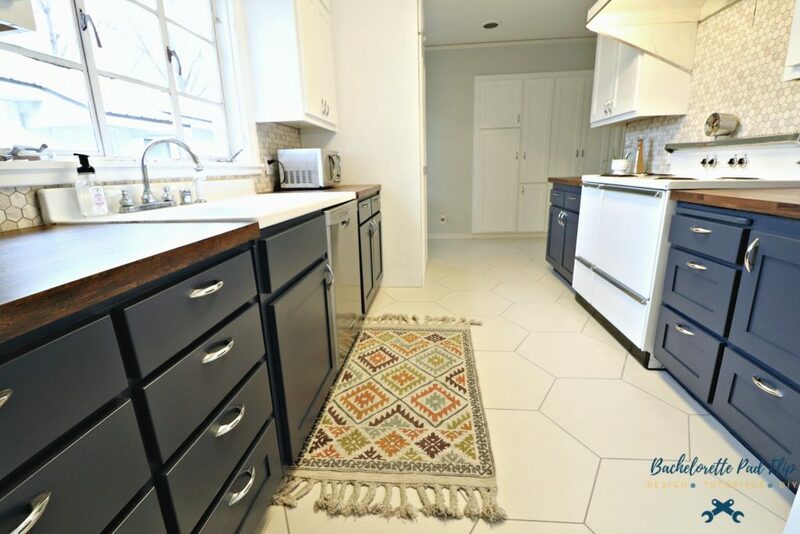 The vintage stove, vent hood and sink are real gems and your decision to keep them were totally spot on – they add so much character to the updated room. . . LOTS and LOTS of charm here. Congratulations on a job well done.